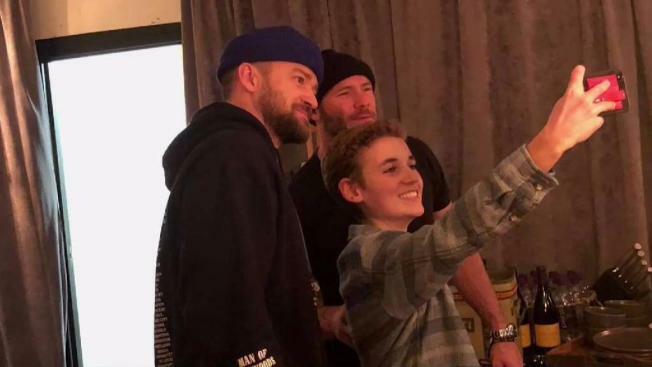 The famous "Selfie Kid" from Super Bowl LII had the chance to reunite with Justin Timberlake in Boston Wednesday night. The famous "Selfie Kid" from Super Bowl LII had the chance to reunite with singer Justin Timberlake in Boston Wednesday night. Timberlake was at the TD Garden for the first of two concerts as part of his 'Man of the Woods' tour and met up with Scituate, Massachusetts, native Ryan McKenna. The 13-year-old was captured back in January snapping a selfie with Timberlake during the Super Bowl halftime show while wearing a shirt from Sunday River ski resort in Maine. McKenna's Instagram picture went viral and he even got to go on the "Today" show to talk about the experience. On Wednesday night, McKenna was invited backstage and got to take another selfie with Timberlake. "I went into Justin's dressing room and he like surprised me — jumped out. And he was like, 'what's up man?! '", McKenna recalled. "And then we took another selfie. And then Patriots players came in — Julian Edelman, which was so cool because I'm a huge Patriots fan." Timberlake returns to the Garden Thursday night for his second concert.